Here we have Rita Roberts’ translation of Linear B B tablet KN 894 Do 04, which I find quite fascinating, even though it is so short. This is because of the supersyllabogram ZE, which literally means “yoked with a pair of” or as Rita Roberts puts it “a team of oxen”. In addition, we have the enclitic QE following the name Tomako, which means “and”, implying that there was another herdsman mentioned before Tomako; hence, the tablet is left-truncated as well as right-truncated. Phaistos fragments in Linear A 8a/8b apparently deal with the harvesting of olives from 8 olive trees + 2 bushel-like units of grains or wheat by 11 harvesters employing a team of oxen. It certainly makes perfect sense. There is also mention of 1 bushel-like unit of sharia wheat. When I say “bushel-like”, I am merely making an approximation, since we have no idea of the exact actual standard unit of dry measurement for grain was in Mycenaean times. Note that since this fragment is from Phaistos, it is much more likely that it is inscribed primarily in Mycenaean than in Old Minoan, since Phaistos was a Mycenaean settlement. So once again, we are faced with the prospect that we have here a fragment inscribed in Linear A just prior to the adoption of Linear B as the official Mycenaean syllabary, and once again, the fragment probably dates from ca. 1450 BCE. This happenstance, if that is what it is, lends further credence to the hypothesis that a number of Linear A tablets were inscribed either in an admixture of Old Minoan, the original Minoan language, and New Minoan, the Mycenaean derived superstratum. In this particular case, I would even go so far as to contest that even the word sara2 (sarai) is an Old Minoan hold out which leaked into Mycenaean Greek. As I shall demonstrate in the next post, there appear to be at least two score Old Minoan words which survived into Mycenaean Greek. This phenomenon is analogous to Anglo-Saxon words surviving into Medieval and Modern English, even though Germanic (i.e. Old English or Anglo-Saxon) comprises only 26 % of all English vocabulary, the other 64 % + being either of Norman French, Latin or Greek provenance. The probability that latter-day Linear A fragments appear to be inscribed in a mixture of Old Minoan and New Minoan (the Mycenaean derived superstratum) lends further credence that the Linear A syllabary, in its latter-day existence, just prior to its abandonment in favour of the new official Linear B syllabary, was simultaneously the syllabary of both Old Minoan and New Minoan, at least by ca. 1450 BCE. This is post 1,500, in a long run of posts since the inauguration of our major Linear A, Linear B and Linear C site in the spring of 2013, making this the premier Internet site in its league. Not much to say here. I said it all in the last post. Unlike Linear B tablets on sheep, of which there are over 500, those dealing with teams of bulls or oxen are very rare, amounting to no more than 7 all told. Although this seems to defy common sense, it actually does not, since the raising of sheep was by far the most important activity of the Minoan/Mycenaean economy. In addition, the text on these tablets on bulls or oxen is so simple and so predictably repetitive that one wonders whether or not the scribes attached much importance to them. The mere fact that two of the tablets repeat the same name, Stomarchos, makes me wonder why any scribe would bother repeating text which is almost identical on two tablets, since this practice is almost unheard of on the tablets dealing with sheep, and on military, vessels and textiles tablets, which are the standard. The two tablets with his name on it do not appear here. Only one of them. But there you have it. Here we encounter the all-new supersyllabogram QE inside (incharged) in the ideogram for linen (under)tunic. It is crucial to understand that this supersyllabogram QE is completely unlike the previous one, QE inside a shield = “a wicker shield”. This new supersyllabogram QE, qeqinomeno, literally means “woven”, hence it refers to “a woven undertunic” or to be more precise, “a woven linen undertunic”, which once again the Mycenaean warriors wore under their toraka = ancient Greek thoraxes, i.e. Their breastplates. These two supersyllabograms are entirely different and must never be confused. This is the one and only instance in Mycenaean Linear B in which the same supersyllabogram appears inside two different ideograms, the first for “a shield” and the second for “an undertunic”. These two supersyllabograms QE + shield and QE + undertunic appear in the military sector only, and in no other sector of the Minoan/Mycenaean economy. This is Slide H of my lecture, “The Rôle of Supersyllabograms in Mycenaean Linear B ” I shall be giving at the Conference, “Thinking Symbols” at the Pultusk Academy of the Humanities, associated with the University of Warsaw, Poland, between June 30 & July 2, 2015. It clearly illustrates the marked difference between an associative (as) and an attributive supersyllabogram (at). “114 ewes on a plot of land which is a usufruct lease field”. Associative supersyllabograms proliferate in the agricultural sector of the Mycenaean economy, and are also characteristic of the military sector. Associative SSYLS are not symbiotic. Talk about a shortcut! Of course, many of us already know by now that the Mycenaean scribes frequently resorted to this clever stratagem to save plenty of space on what are, after all, very small tablets, rarely more than 30 cm. wide by 15 cm. deep, and usually much smaller. On the other hand, attributive SSYLs (at) always modify the the sense of ideograms on which they simultaneously depend as the ideograms themselves depend on them through the attributive qualities they assign to the latter. In other words, the relationship between the attributive supersyllabogram and the ideogram which it modifies is both symbiotic and auto-determinative. The plain ideogram for “cloth” has nothing inside it. But when the ideogram for “cloth” is assigned an attribute (usually defined as an adjectival modifier) that ideogram contains inside itself the supersyllabogram which unequivocally modifies its meaning. Thus, the ideogram for “cloth” with the SSYL NE inside it can mean one thing and one thing only, “new cloth”. Likewise, the SYL PU inside the ideogram for “cloth” can only mean “purple cloth”, and nothing else. Similarly, the SSYL TE inside the same ideogram has the specific meaning, “well-prepared cloth” or “finished cloth prepared for market or sale”. Thus, all attributive supersyllabograms modify the unqualified meaning of the simple syllabogram for “cloth” in the textile sector, while similar SSYLS in other sectors, especially the vessels, pottery & vases sector of the Minoan/Mycenaean economy operate in the exact same fashion. Associative supersyllabograms proliferate in these two sectors. There is absolutely no doubt about it. Chris Tselentis hit the nail right on the head. In addition, he also cleverly intuited the meaning of the second supersyllabogram appearing right after the first (ZE) on the same tablet, i.e. MO which he correctly translated as “monos”, meaning “only 1, 1 only or – single- ”. However, he did not take his insight any further. This is undoubtedly due to the fact that he must not have had the occasion or the chance to do as I have had, i.e. to trudge through some 3,000 tablets in the Scripta Minoa from Knossos. 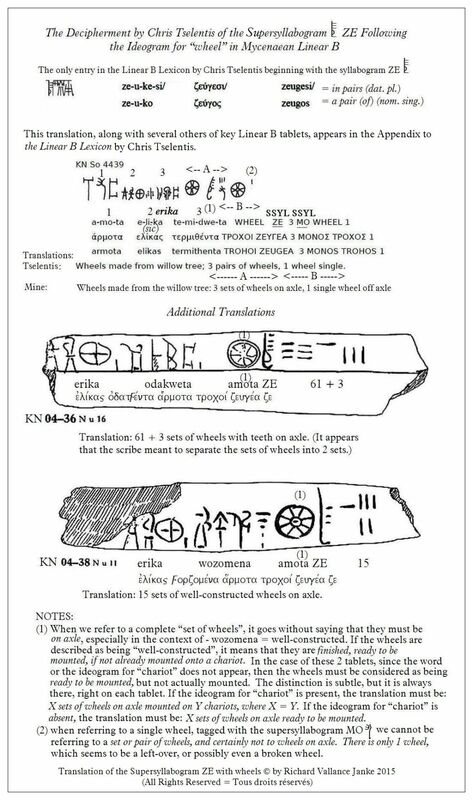 Missing that opportunity, he could not have realistically been expected to discover that there were 24 other Linear B tablets from Knossos sporting the precise same formula, the ideogram for “wheel(s)” + ZE. Nor could he have possibly known that there were not just scores, but hundreds of other Scripta Minoa tablets, on which scores of other formulae, constructed on the exact same principles, recurred over and over and over. 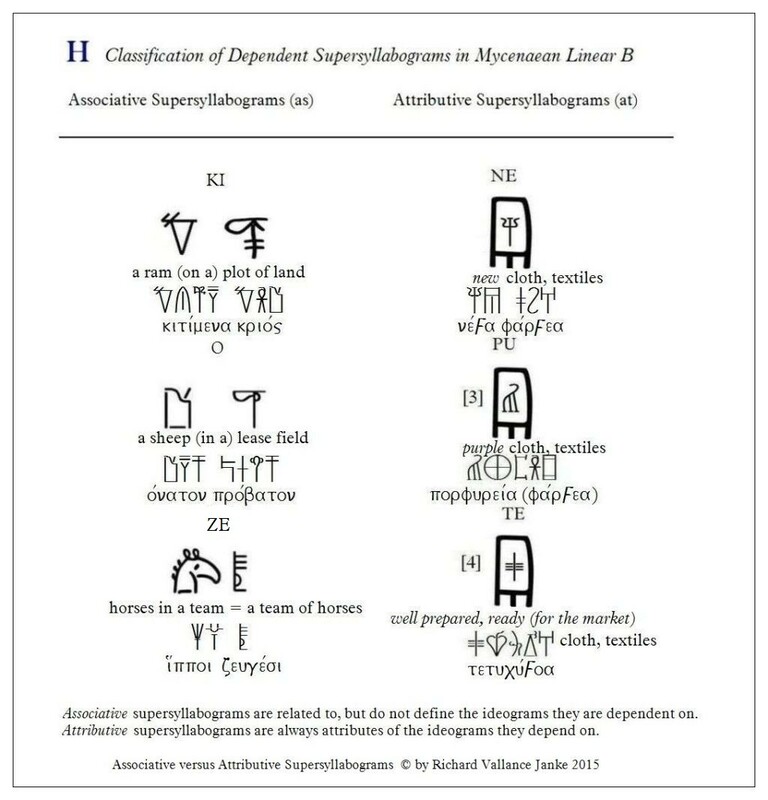 Even if you have no prior knowledge of Mycenaean Linear B, the latinized forms of the ideograms and supersyllabograms you see above make it crystal clear that the template for the formula for ideogram-dependent supersyllabograms is invariable, from one sector to another of Minoan/Mycenaean society. The very inflexibility of the formula = ideogram + syllabogram, in all cases, clearly serves to underscore its authenticity throughout the range of some 800 of 3,000 tablets in Scripta Minoa, where it so frequently re-appears with the absolute consistency you see illustrated above. As I have demonstrated over and over on this blog, the same formulae invariably apply to all sectors of Minoan/Mycenaean society, agricultural, military, textiles, pottery and vessels, and religious, without exception. If the formulae work in one sector, they will work in the next. And since the overall structure of the formulae, i.e. ideogram + supersyllabogram, is always invariable and always in that particular order, we have hit upon a phenomenon in Mycenaean Linear B which has been staring us in the face ever since 1952, when our genius, Michael Ventris, first deciphered the vast majority of the Linear B syllabary, but which no-one, not even Prof. John Chadwick or Chris Tselentis, has ever isolated for extrapolation, at least until now. I must however give both of these brilliant researchers, Prof. John Chadwick & Chris Tselentis, the full credit that is without question due to them, for without their invaluable insights into two specific examples of the appearance of supersyllabograms, one by Prof. Chadwick, and the other by Chris Tselentis (as illustrated by the presence of the supersyllabogram ZE with the ideogram for – wheel – in Knossos Tablet KN SO 4439 above), I would have never been able to extrapolate their discoveries of these two specific occurrences into the general hypothesis of the signal contribution of supersyllabograms, which occur at high enough a frequency (800 times in 3,000 tablets) to warrant their inclusion as actual Linear B words and phrases in the lexicon of extant Mycenaean Linear B vocabulary. What once seemed merely to be stray single syllabograms on so many tablets have turned out not to be simple syllabograms at all, but the first syllabogram i.e. the first syllable of scores of words and even entire phrases in Mycenaean Greek. If this is not a major step forward in the decipherment of Mycenaean Linear B, I don’t know what is.